Set the oven to 190C/375F/gas mark 5. Brush the mushrooms with melted butter and arrange black side down in a shallow tray. Season with a little salt, lemon juice and plenty of ground black pepper. Bake for 10 minutes. Remove some of the soft rind from the cheese and break into pieces. Turn the mushrooms over and put the cheese inside the cups of the mushrooms. 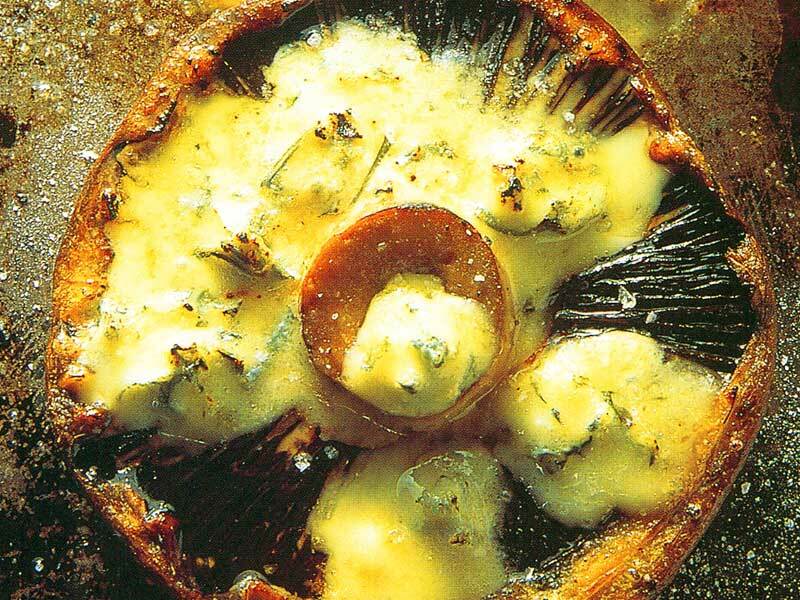 Bake for another 5 minutes until the cheese has melted and the mushrooms are tender. 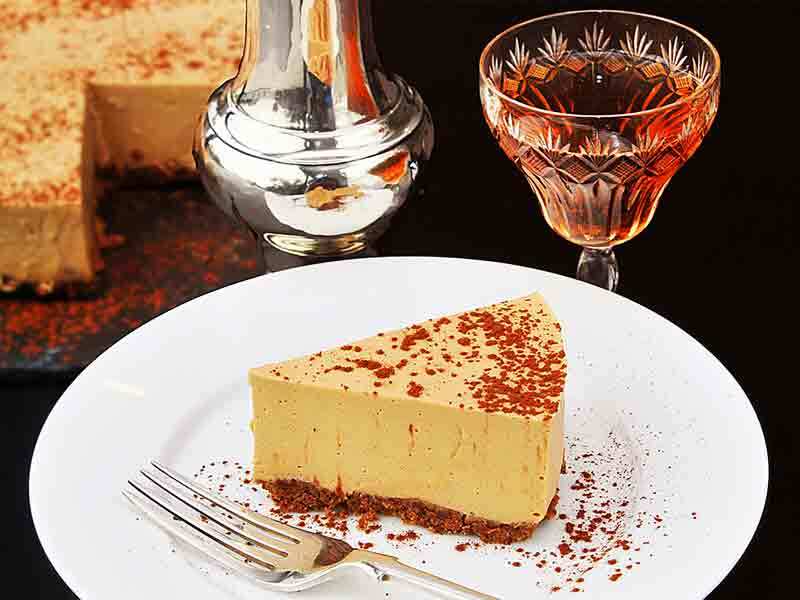 This may seem a curious combination of ingredients - but give it a try. This dip is quick and easy to make and tastes delicious. 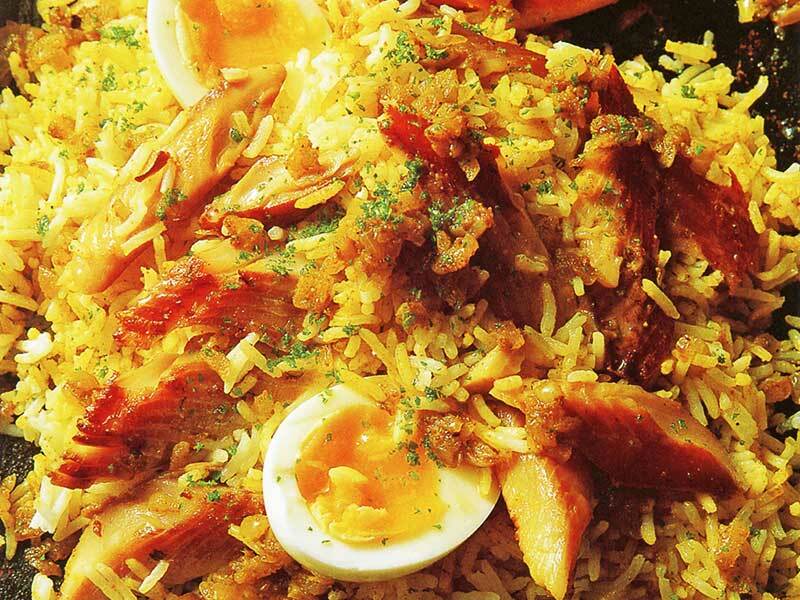 Serve it with drinks or include as part of a buffet. Be sure to use cranberry sauce and not jelly. If you like hot and spicy flavours try making the dip with Sweet Chilli Sauce instead of Cranberry. Use a plate large enough to accommodate the cream cheese in the middle, with the tortilla chips scattered around the outside. Carefully ease the Philadelphia out of the pack in one piece so that it sits in a slab in the centre of the dish. Roughly chop the coriander. Halve, deseed, remove the membrane and finely chop the chilli. (It is the seeds and membrane that carry the heat, so take care not to touch your face or eyes as the juices will burn!) Trim and chop the spring onion. Mix all these ingredients together. Now smother the cream cheese with the cranberry or sweet chilli sauce. Don't despair at this stage as it looks a real mess! Now scatter the coriander and chilli mixture over the whole thing so that the cranberry is completely covered. 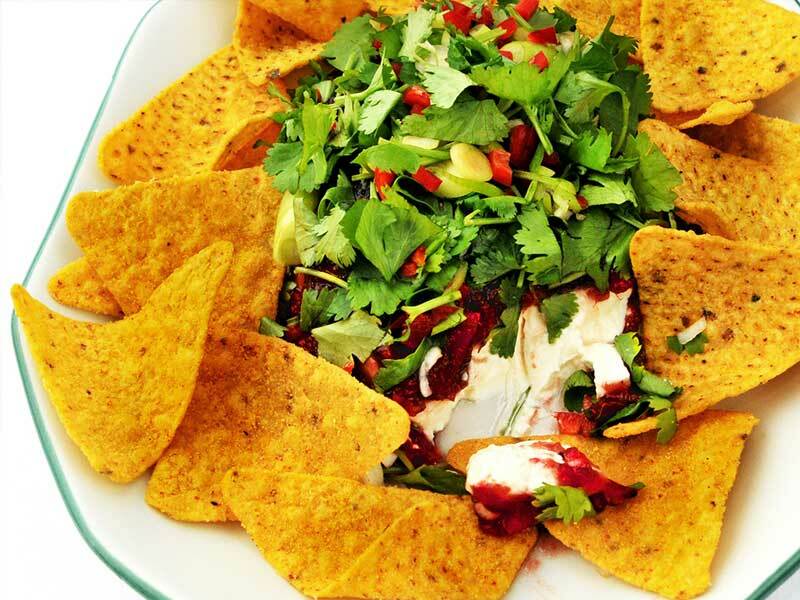 Arrange the tortilla chips around the outside and there you go - one festive-looking dish! Scoop right the way through to enjoy a mouthful of cheese, cranberry, herbs and spice together. It really is delicious! Put the cheese into a bowl. Add the ketchup, mustard, Worcester sauce and Tabasco. Season with a little black pepper and mix together. Remove any tough stalks from the watercress. Wash thoroughly and pat dry with paper towel. Put the cress into a mug and snip into small pieces with a pair of scissors. Stir into the cheese mixture. Heat the grill to high. Put the bread onto a small baking tray and toast a little on each side. Spread half the cheese mixture onto each slice of toast. Place under the grill until bubbling and golden brown. Serve straight away with a handful of watercress on the side. Note: Watercress Rarebit is also delicious served with a poached or fried egg on top. Set the oven to 200C/400F/gas mark 6. 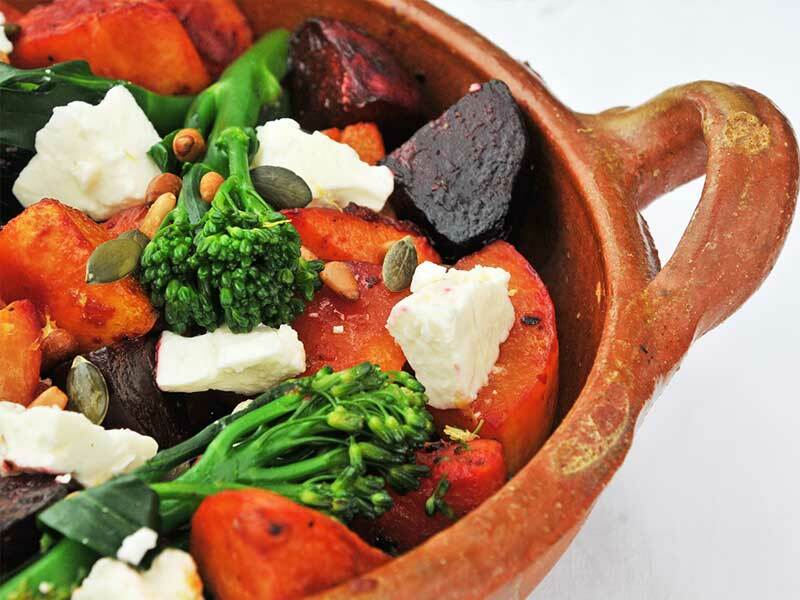 Peel the beetroot and sweet potato and cut into large chunks. Scrape the seeds from the squash and peel. Cut into chunks. Put together in a roasting tin, season with salt and pepper and toss in olive oil. Roast the vegetables for 45 - 50 minutes, turning from time to time. The vegetables should be tender and slightly charred when ready. Meanwhile: put the pine nuts on a baking tray and toast in the oven until golden. This will only take about 5 minutes, they burn very quickly. Trim a little stalk from the broccoli and boil in salted water for 2 - 3 minutes until just tender. Drain. Set the oven to 200C/400F/Gas mark 6. Wash the baked potatoes and prick with a fork. Bake in the oven for about 1 hour until the potato is soft all the way through. 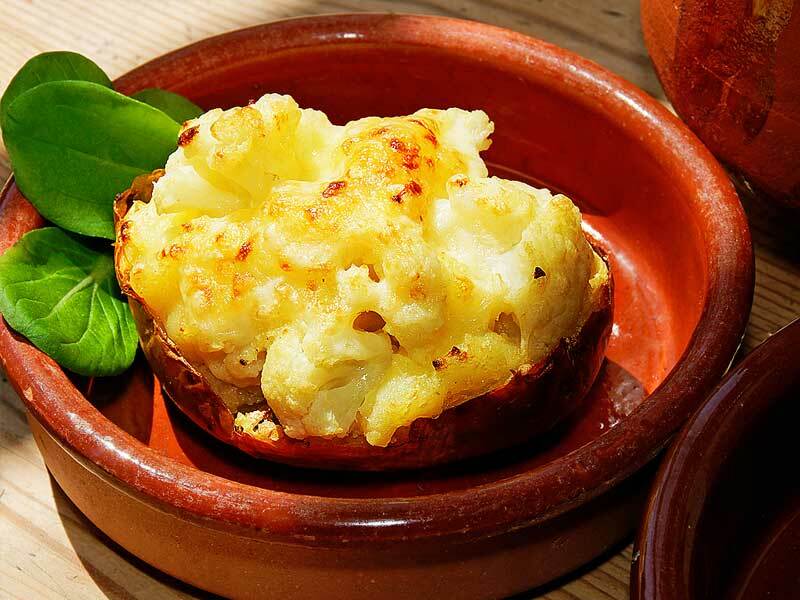 Meanwhile, bring a small pan of salted water to the boil and cook the cauliflower florets for about 2 minutes until just tender. Drain well. When the potatoes are cooked cut in half lengthways. Scoop out the middle and mix with salt, pepper, the butter and three quarters of the cheese. Now gently stir in the cauliflower. Spoon the mixture back into the potatoes and set on a baking tray. Scatter with the remaining grated cheese. Put back into the oven for 10 minutes until golden brown. Serve with a pile of watercress arranged on the side. Untie the shoulder of lamb and trim any excess fat. Lay the meat skin side down in a plastic or glass container. Scatter over the herbs, garlic, olive oil, soy and season. Fold in half, cover and chill. Marinate for at least an hour or overnight. Preheat the oven to 200C/400F/Gas mark 6. Lay the lamb skin side up, with the herbs and seasonings tucked underneath, in a roasting tin. Sprinkle with salt and pepper and roast for 1 hour. Meanwhile prepare the vegetables: Simmer the carrots and new potatoes in boiling salted water for about 10 minutes until “al dente”. Add the beans and radishes and boil for a minute. Drain and cool. Mix together with the sugar snaps or asparagus and cucumber and set aside. Remove the lamb from the roasting tin and set on a carving board to rest. Drain the fat from the tin and add the stock or wine. Bring to the boil stirring all the time to remove the sticky juices from the bottom of the pan. Continue to boil until reduced and syrupy. Adjust the seasoning. Now finish the vegetables: Melt the butter in a sauté pan or wok. When foaming add the vegetables and toss over the heat until hot all the way through. 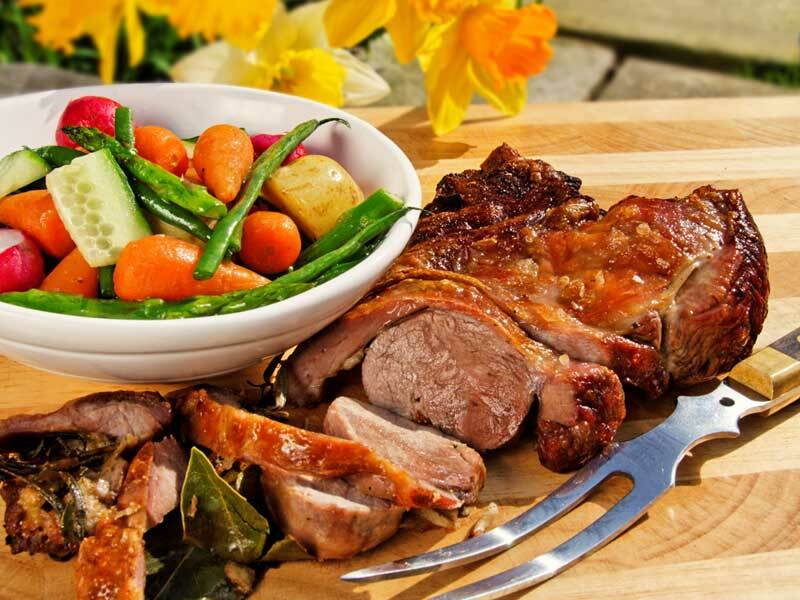 Slice the lamb and serve on warm plates with a drizzle of the gravy and a helping of vegetables. 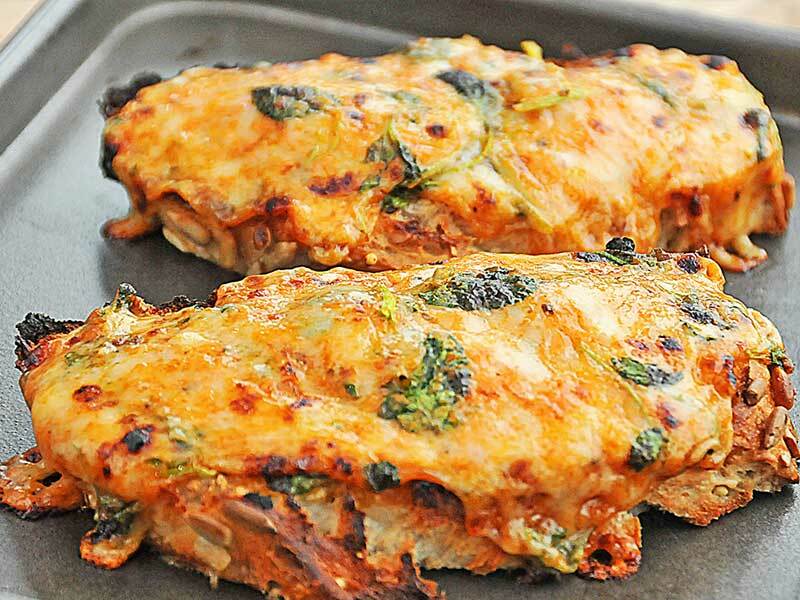 These chicken breasts are ideal served hot or cold with Salsa Verde and a leafy green salad. Preheat the oven to 200C/400F/gas mark 6. Trim the chicken breasts and cut into the thick part of the meat to make an opening to hold the stuffing. Season with salt and pepper. Chop the peppers and mix together with the cream cheese. Divide the mixture into four and stuff each quarter inside a chicken breast. 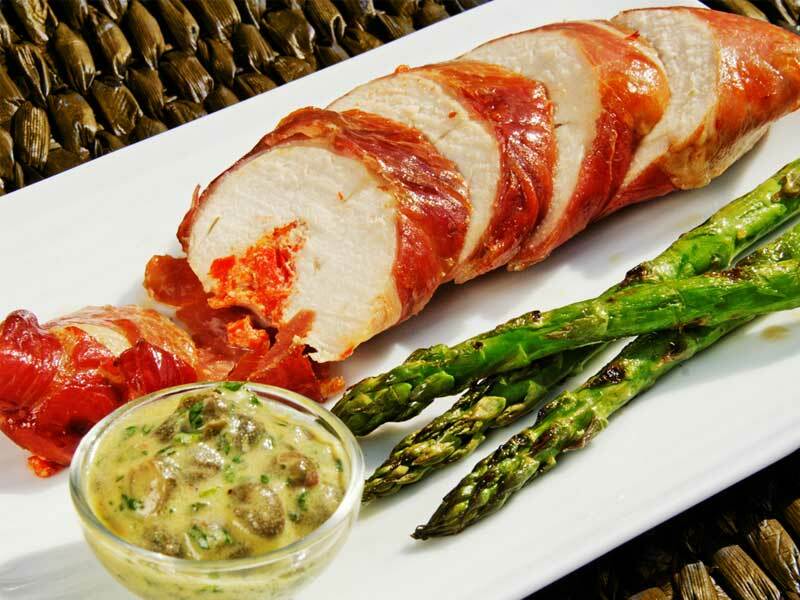 Fold the breast meat over to enclose the stuffing and wrap two slices of Parma ham around each one. Place on a shallow baking tray. Bake for 30 minutes until the chicken is tender and the juices run clear when pierced with a sharp knife. To make the Salsa Verde: Very finely chop the capers and herbs. Put the mustard and vinegar into a bowl and whisk together. Gradually whisk in the oil. Stir in the the herbs, capers and spring onion. Season with salt and pepper. To serve cold: Allow the chicken to cool completely. Slice on the diagonal and arrange in overlapping layers on a serving plate. Serve the Salsa Verde on the side. Melt the butter in a medium pan. When foaming, add the onion and cook until soft and transparent. Add the curry powder or paste and stir over the heat for one minute. Add the rice and lentils and stir until coated in the buttery juices. Pour in the stock, add the cardamom pods and season with pepper. Bring to the boil and continue boiling until small craters appear on top of the rice. Turn off the heat, cover with a piece of tin foil and clamp on the lid. Leave to stand for 15 minutes. Meanwhile, lay the kipper fillets in a heat proof dish, cover in boiling water and leave to stand for two minutes. Remove the skin and any bones and break into large pieces. Cut the salmon into chunky strips. When the rice is ready, loosen with a fork and remove the cardamom pods. Gently stir in the kippers, salmon, spinach and herbs. Adjust the seasoning with pepper and lemon juice and top with the boiled eggs. Serve straight away with a green salad on the side. Knead the meat together with the oats, courgette, herbs, spices, chilli and season with salt and pepper. 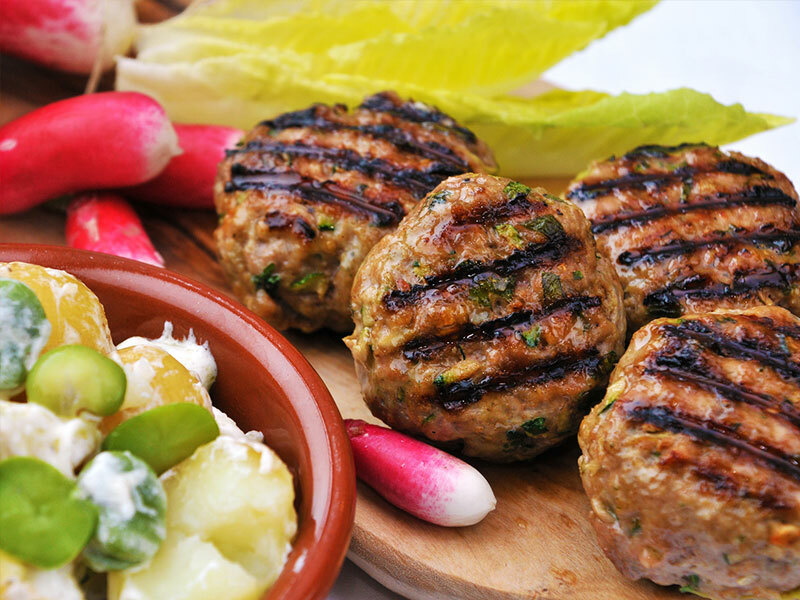 Divide the mixture into four to make burgers or 20 to make kofta kebabs. Knead each piece of meat very firmly to make sure it sticks together. Shape the burgers into patties or the koftas into ovals. Thread the koftas lengthways onto kebab sticks. Boil the potatoes in salted water until tender. Boil the beans until tender. Drain and slip off the outer skin - leaving the bright green inner kernel. Heat the grill to high or brush a griddle with oil and heat until piping hot. Cook the burgers or kebabs, turning from time to time until nicely charred and cooked all the way through. Alternatively, the burgers or kebabs can be cooked on a barbecue. Meanwhile: drain the potatoes, add the beans, spring onion and butter. Season with salt and pepper. Place the pan over a low heat and lightly crush and stir the potatoes. Add the yoghurt and stir briefly. Put the koftas onto four warm serving plates with a spoonful of potatoes on the side. Serve with a leafy mixed salad. Put the fruit into a pan with the grated apple and two tablespoons of water. Add two spoonfuls of sugar, heat gently and allow to bubble for about 10 minutes until the fruit has started to release its juices. Taste to check the sweetness. 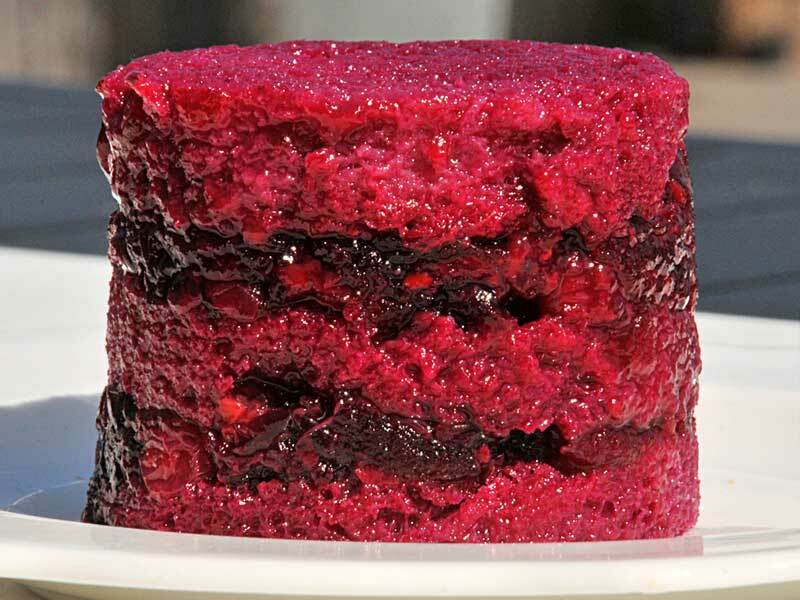 The trick of a summer pudding is in finding the correct balance of sweetness and tartness. Add more sugar if necessary. 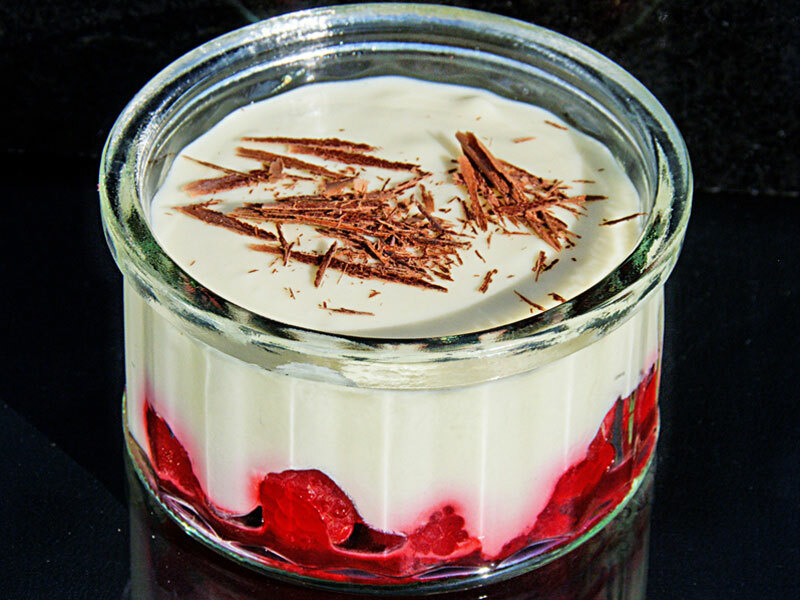 Use 4 x 7cm ramekins or similar to assemble the puddings. Cut 12 circles of bread to fit exactly into the dishes. Strain the fruit. Dip four circles of bread in the juices and use to line the base of each dish. Share half of the fruit between the four dishes. Now top each one with another bread circle dipped in juice. Repeat this process one more time. The puddings will have two layers of fruit sandwiched between three bread circles. Set the dishes on a small tray. Spoon in plenty of juice, reserving any excess. Cover with another tray and put weights or 500g cans on top to press the filling down. Cool and refrigerate for several hours, preferably overnight. Loosen the edges of the puddings with a knife - making sure a little air has reached the base of the pudding. Gently shake out onto individual serving plates. Drizzle with any reserved juice and serve the cream separately. Soak the gelatine in a bowl of cold water. Pour the boiling water onto the coffee and leave to stand for 2 minutes. Strain and discard the grounds. Put the soaked gelatine into the hot coffee and stir until dissolved. Set aside to cool. Put the biscuits into a plastic bag and crush with a rolling pin or use a food processor if you prefer. Melt the butter and mix with the biscuit crumbs. Spread over the base of a 17cm/7”deep flan dish or spring-release cake tin. Press down well. Put the cream cheese in a bowl and stir to soften. Gradually stir in the double cream, making sure there are no lumps before adding more cream. Now add the liqueur, and vanilla essence and gradually stir in the cooled coffee. Sweeten to taste with the sugar. Pour onto the biscuit base and chill until set, preferably overnight. Sift on a light dusting of cocoa powder before serving. Break the white chocolate into small pieces. Put 150ml/¼ pint of the cream into a pan and heat until steaming. Remove the pan from the heat and add the chocolate. Stir from time to time until the chocolate has melted. Set aside to cool. Arrange the raspberries in the base of individual dishes and slightly crush with a fork. Sprinkle over a little kirsch. Lightly whip the remaining double cream and fold into the cooled chocolate mixture, together with the yoghurt. Spoon the mixture on top of the raspberries and tap the dishes on the work surface to even out the top. Cover and chill for 3 - 4 hours or overnight, until set. Decorate with a little grated or shaved chocolate. First make the pastry: Rub the butter into the flour until it looks like fine breadcrumbs. Add the sugar and enough of the water to bind to a firm dough. Knead gently into a smooth ball. Preheat the oven to 190C/375F/Gas mark 5. Dust the worktop with flour and roll the pastry to a circle the thickness of a 2p piece. Use to line an 18 cm/7in flan dish. Put the pastry into the refrigerator to chill. Put all the frangipane ingredients together in a bowl and beat until pale and creamy. Spoon this mixture into the pastry case and spread evenly. Halve and destone the plums. 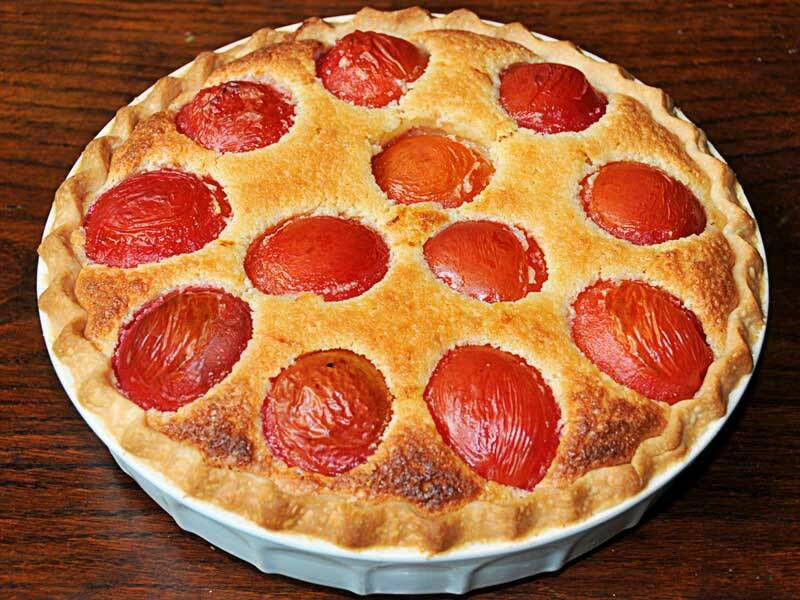 Press gently into the frangipane to cover the top of the tart. Bake until golden brown. The filling should feel firm when pressed lightly with the fingertips. Note: Apples, pears or apricots work just as well as plums. Preheat the oven to 190C/375F/Gas mark 5. Oil a 17cm/7” deep spring-release cake tin. Line the base with a disc of greased greaseproof paper. Trim the rhubarb and cut into pieces about 2.5cm/1" long. To make the crumble: Sift the flour and ginger together. Cut the butter into small pieces and rub into the flour until the mixture resembles breadcrumbs. Stir in the sugar and oats and set aside. To make the cake: Put the butter, flour, the 80g/3oz sugar and eggs in a bowl. Beat together for a minute or two until pale and slightly fluffy. Spoon the mixture into the prepared tin and smooth the top. 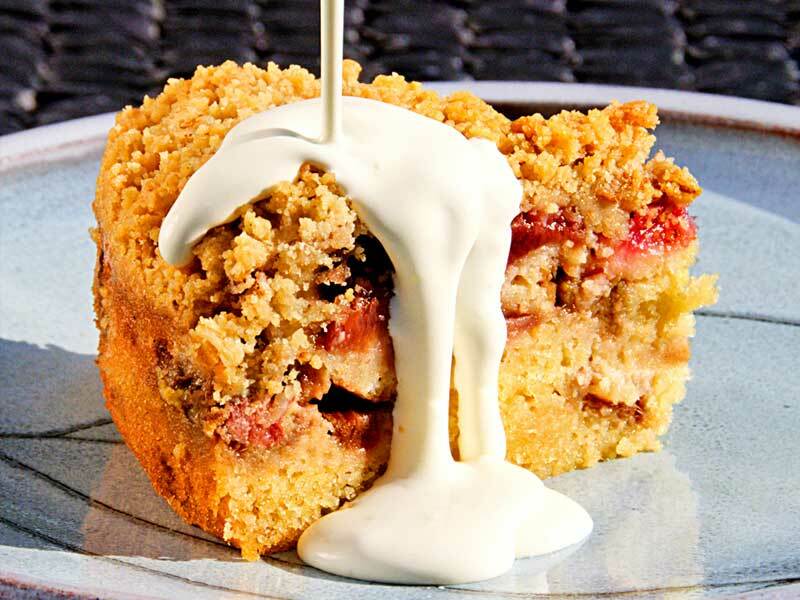 Carefully arrange the rhubarb on top of the cake mixture and sprinkle with the extra tablespoon of sugar. Lastly, scatter the crumble mixture over the whole cake. Bake in the preheated oven for 30 - 40 minutes, until the cake is golden brown and crisp on top. Loosen the edges with a knife and cool completely in the tin before turning out. Serve cold or warm with cream, ice cream or custard. Set the oven to 375F/190C/Gas mark 5. Beat the butter and sugar together until light and fluffy. Add the vanilla essence. Stir in the flour and ground rice and gently work into the butter mixture to form a firm dough. Gently knead the dough until smooth. Roll out the dough to about 1cm thick. 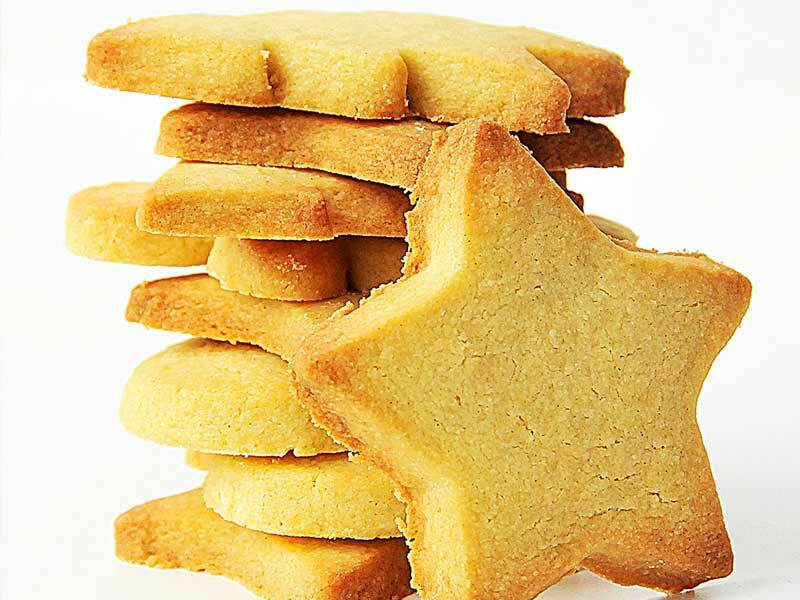 Cut the shortbread into stars or any other shapes. Set the biscuits on a baking tray. Bake for about 20 minutes until golden brown and a little firm. The shortbread will still be soft when you take it out of the oven. Leave it for a few minutes and then lift onto a cooling rack to cool and crisp.